The Autistic Self Advocacy Network has developed a useful resource on legal capacity or decision making rights for people with disabilities. 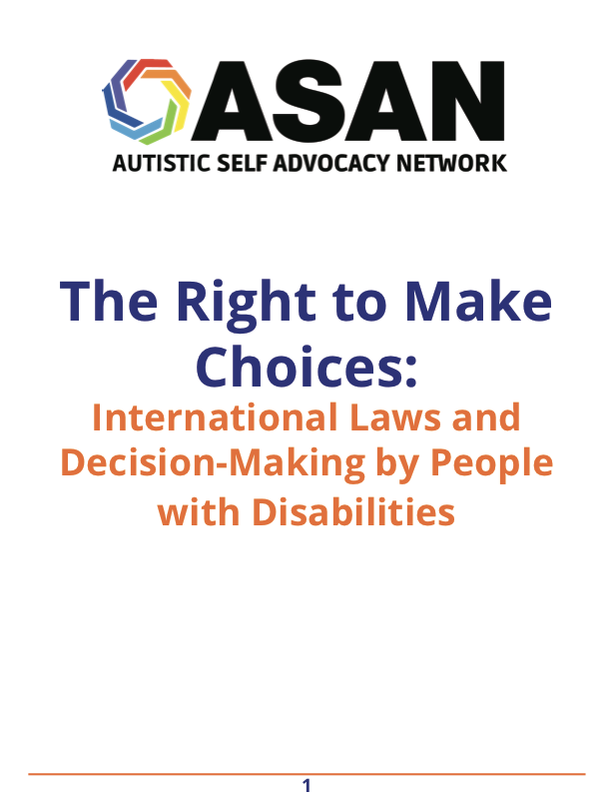 The guide entitled a ‘The Right to Make Choices: New Resource on Supported Decision-Making’ is available on the networks website in both easy to read and plain language or family friendly formats. The guide looks at international human rights law on legal capacity and discusses supported decision making and guardianship in an accessible format. It also examines the current law in countries such as the United States, the United Kingdom and Sweden. The resource breaks down the obligations under Article 12 of the Convention on the Rights of Persons with Disabilities. It also examines supported decision making in detail and gives practical and accessible examples of what is a good support, how to make a legally binding agreement with a supporter and the difference between guardianship and supported decision making. and run by and for Autistic people. The network aims to advance the principles of the disability rights movement with regard to autism and does so through public policy advocacy, the development of Autistic cultural activities, and leadership trainings for Autistic self-advocates. The network also provides information to the public about autism and disability rights.